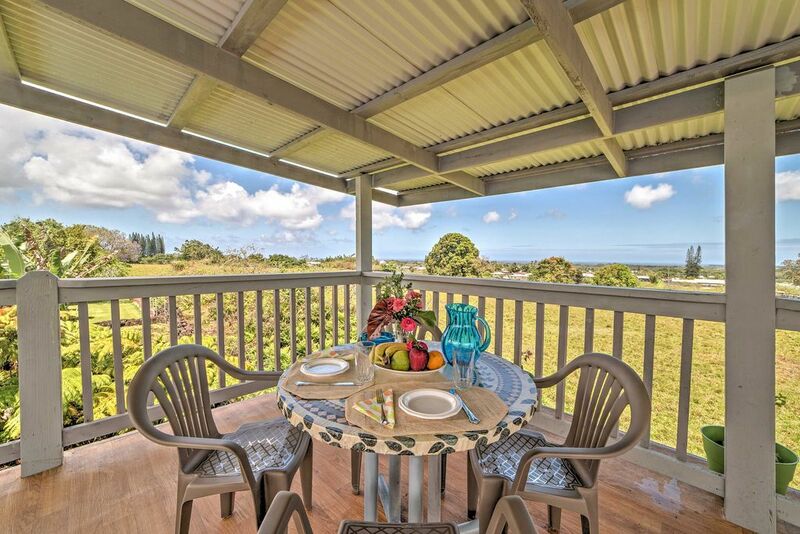 Surprise your loved one with a romantic Hilo getaway to this tropical 1-bathroom vacation rental studio that sleeps 2 adults and 1 child. Nestled at the end of a street in a safe neighborhood, this studio features an elevated covered deck with 360-degree ocean and mountain views, and a prime location, minutes from golf courses and beaches, ensuring a memorable retreat! Let the cares and worries of your everyday life melt away as you drive up the street of the tranquil Hilo neighborhood. When you reach the dead end of the street, you’ll be greeted by the property’s papaya and tangerine trees surrounding your home-away-from-home. Make yourself at home in 440 square feet of cozy living space, featuring tropical decor and comfortable furnishings that ensure a relaxing stay. Curl up on the plush couch to watch your favorite shows on the cable TV in the living space, with black-out curtains for privacy, which is also combined with the studio’s bedroom. Cozy up on the comfy king-sized bed for peaceful slumbers at the end of each exciting day. Wake up to the sunlight shining through the large window beside the bed. Utilize the refrigerator, 2 burner cook-top, and microwave to prepare a tasty breakfast to energize you for the day. Gather around the charming dining room table to enjoy your home-cooked meals. For an al fresco dining experience, step out onto the shared elevated covered deck, where you’ll enjoy 360-degree ocean and mountain views, along with cool breezes. While staying at this ideally-located studio, you’ll have the best of both worlds, with the privacy of your tranquil abode at the end of the street, and a prime location, minutes from endless attractions. Be sure to check out Rainbow Falls, Liliʻuokalani Park and Gardens, Hawaii Tropical Botanical Garden, and Panaewa Rainforest Zoo during your time in this beautiful area. Prince Kuhio Mall, Walmart, Ross' Dress for Less, Office Depot, Home Depot, Safeway, Target, KTA Supermarket, SacknSave Supermarket (aka Foodland), Long's Drugs (CVS) are all 5 minutes away with numerous restaurants and a theatre! If you’re not up for cooking at the house, dine out at one of the delicious nearby restaurants, including Hilo Bay Cafe, Zippy's, Okazuya, Cafe Pesto, and Spoonful Cafe (Thai) in Keaau just 10 minutes away. Be sure to bring your golf clubs to practice your swing at the Hilo Municipal Golf Course, just 2 blocks away from the property! For a day by the sandy shores, beaches are just 10 minutes away, and there are 2 boogie boards available that are shared with the neighboring property for splashing around in the ocean waters! - Prime location - Minutes from Prince Kuhio Mall, Walmart, Ross' Dress for Less, Office Depot, Home Depot, Safeway, Target, KTA Supermarket, SacknSave Supermarket, Long's Drugs (CVS), Hilo Municipal Golf Course, Lincoln Park Public Tennis Courts, and beaches! Nice place. Neighbors in the big house a little noisy but overall I would rent again. Can't beat for the price. Lovely sweet place, location and owners! We loved it here! We will be back definitely!! Awesome Place For A Home Away From Home Providing You Have Cooperative Neighbors! My teenage daughter and I really loved staying here for 10 days. My daughter enjoyed posing as I took photos of her outside. This place was more homey than a hotel, and we did not mind the coqui frogs but we were bothered by the annoying co-tenants (neighbors) in the adjacent 3 bedroom side of this house. They ignored the "no noise rule" after 10pm. They would leave the dryer on for a load while they left at noon, and then when they came back, they would turn on the dryer starting at 11:15pm at night right in the back of our studio bathroom window. We were left without the use of the shared washer and dryer for most of the day. The following morning, the dryer went on at 9am to dry their second load left the previous day. I had to take our dirty clothes to my niece's place to get them washed and dried. Secondly, these inconsiderate guests would constantly go in their cars to get things, and the horn would toot loudly multiple times as the car remote relocked the doors at night right in front of our bedroom window, 4 feet away. We actually applauded quietly when we heard the rolling suitcases as they loaded their cars to leave 2 days before we did. It was like a scene from the "Bachelor" as the driver took the suitcase when a bachelor contestant was sent home. Yes, we would stay here again. Very convenient location, just a short drive to dining, shopping & attractions. Smooth check in & out procedures. Studio fully appointed with all the necessities. Very spacious also! Only down fall is the noise from the coqui frogs when it gets dark, which comes with the terrain so not much you can do when it comes to that. Overall very enjoyable place to stay for a few nights or long term. We needed a place to stay in the Hilo area for an event, and this was perfect! The house had everything we needed. It was clean, had plenty of room, and a beautiful view from the lanai. The house is in a nice, quiet neighborhood; you will hear coqui frogs, but we loved that! I would definitely stay there again. Thanks so much!